Bad breath, medically known as halitosis, is a condition that even healthy children can sometimes experience. If you've noticed that your little one's breath is not so pleasant, there is hope. When it comes to bad breath in children, most of the time improper oral hygiene is the culprit. If your child doesn't brush and floss his teeth frequently, bad breath can result. If plaque is not brushed away, it can irritate the gums, causing additional issues. The tongue can also harbor bacteria that produce foul odors and bad breath, so make sure your child is brushing his tongue as well. Saliva helps to cleanse the mouth. When your child's mouth is producing less saliva than normal, xerostomia may occur, which contributes to bad breath. When a child breathes through his mouth (due to a stuffy nose or as a sleep habit), it prevents saliva from washing away bacteria, which promotes bad breath. Most odor causing bacteria reside on the tongue. Bad breath can also come about as a result of cavities, plaque buildup, mouth sores, or oral surgery. Sometimes a baby or toddler will place a foreign object (tiny toys, food particles, etc.) in his or her nose. A foreign object lodged in the nose can cause bad breath in children. If your child consumes foods that have a strong odor, like garlic, onions or specific spices, it can impact the freshness of his breath. Sometimes, the way medication breaks down in the body can lead to bad breath. This process releases chemicals that may result in bad breath. If your child is suffering from allergies, a sinus infection, tonsillitis or another condition, bad breath can occur. 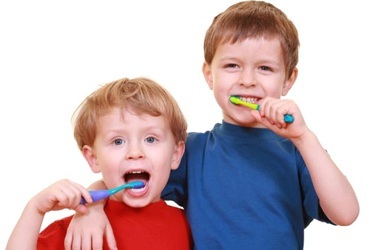 Healthy teeth are integral to a child's overall health and well being. You can help your child avoid bad breath by developing an oral care routine.Have your child brush twice a day with an ADA accepted fluoride toothpaste to promote fresh breath. Always remember to supervise young children so they do not swallow the toothpaste.When your child brushes his teeth, make sure he also cleans his tongue, as bacteria can collect and grow on the tongue.Floss daily in order to remove odor causing food particles from the teeth.Remember to get a new toothbrush every few months, because dull bristles cannot effectively remove plaque and debris from the teeth.Avoid halitosis and other oral health concerns by scheduling regular checkups and professional cleanings with a dentist. Most of the time, your child's bad breath will go away once you implement better oral hygiene. However, some children may experience chronic bad breath. If a dentist determines that your child's mouth is healthy, you may be referred to a primary care physician for additional tests to diagnose the underlying cause of the halitosis.Regardless of the cause of bad breath, teaching children how to form good dental care habits at an early age can be vital in terms of their oral health as adults.Learn more by reading about bad breath in the Colgate Oral Care resources.